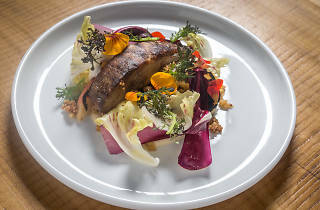 Eight months after Przemek Adolf opened and quickly shuttered the brick-and-mortar arm of his zero-waste catering service Saucy by Nature, the chef-locavangelist has revamped the space as a 32-seat farm-to-table restaurant, fondly named after his schnauzer, Jinkx. 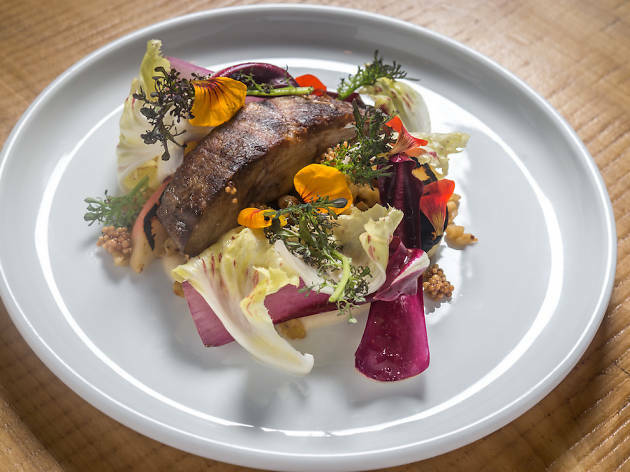 In collaboration with executive chef Gus Ulrich (Esme), Adolf doles out vegetable-forward dishes including a skirt steak salad tossed with cured egg yolks, a black-bean tartare with quail eggs, and mackerel slicked in kohlrabi consommé. Diners can share plates at a central 10-seat concrete table or settle into Viennese-style curved-wood chairs along the perimeter of the dining room, which is inspired in part by Weimar-era Berlin (artwork is displayed in gilded picture frames, and the space is sectioned off with gold velvet curtains). Cocktails are served in vintage glassware and are named after famous German intellectuals and artists: The Neitzsche features bourbon with kirsch, Aperol and sweet vermouth, while the gin-based Deitrich yields Luxardo liqueur with crème de violette and lemon juice. Very nice place with great interior design. The food and cocktail menus are both great. Portions are not very big but the quality and taste are great! I recommend the flat bread and the skins for appetisers. For the main dishes they serve a lamb belly that melts in your mouth! Definitely the best option!! The cocktails are great, nice mixes and nicely served, specially the one with violet flower. The staff is very kind but very slow, the only downside of this place. Amazing new spot, beautiful cocktails, amazing food, stellar wine list, and gorgeous space. The prices are crazy low for the experience and quality. Highly recommend! Awesome farm to table restaurant. The food and drinks are really wonderful and the staff are friendly and really knowledgeable about the menu. This is a very unique and charming place.